Boston Police report a kayak trip into Dorchester Bay went awry for two men yesterday afternoon after their kayak took on water and sank, forcing them - and their dog - to swim through 40-degree waters to a nearby buoy, which they grabbed onto, hoping for rescue. Read more. The US Attorney's office in Boston reports it's suing the city of Quincy for letting its sewers overflow into Boston Harbor in general and Dorchester Bay and Quincy Bay in particular. Read more. The Boston Fire Department alerts us that the South Boston Yacht Club will be sponsoring fireworks tonight, starting around 9:15 p.m. "You may hear some noise," BFD notes. Usually we just have one mayor, but this week, we have hundreds, here for the US Conference of Mayors, and they'll be celebrating with a fireworks display from the water off the Kennedy Library, starting around 9:30 p.m. So get yourself to a Dorchester or South Boston beach or high point, or just get your dog's thunder blanket ready. 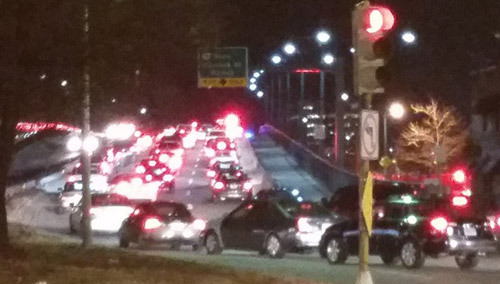 The Boston Fire Department reports firefighters rescued a woman who had somehow wound up in the water off the JFK Library around 11 p.m. on Tuesday. She was semi-conscious when brought up to shore and handed over to EMS for transportation to a local hospital. 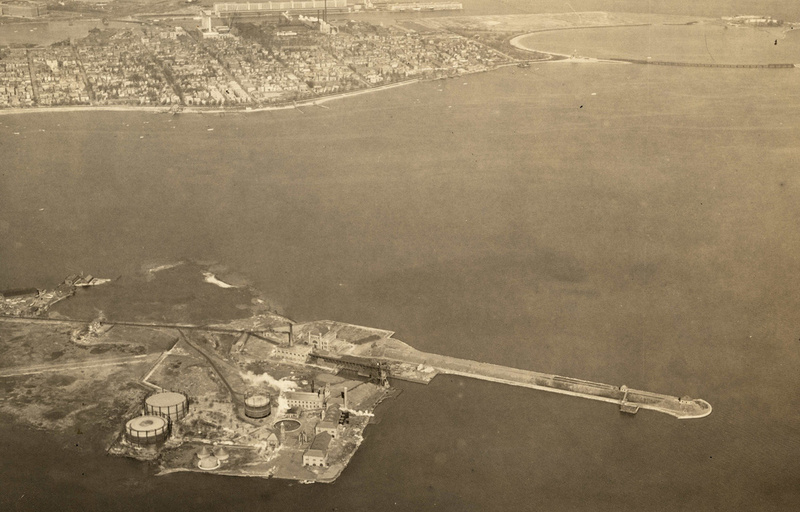 This 1923 aerial photo from the Boston Planning Commission shows the MDC's Calf Pasture sewage pumping station and some nearby gas tanks, Old Harbor and South Boston's City Point and Castle Island. Read more. 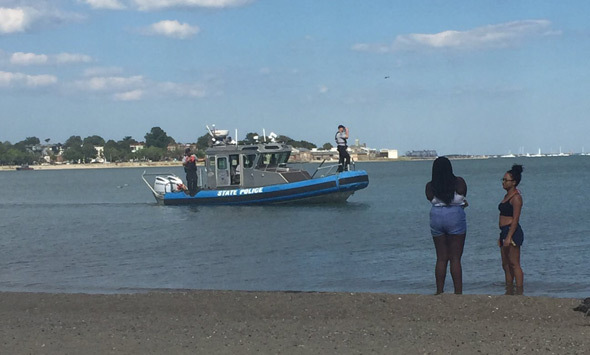 Paul Nutting watched the BPD Marine Unit investigate a sailboat on the rocks off Castle Island in Dorchester Bay this afternoon. At least when we get a king tide, like we did overnight. Maria Lyons visited Tenean Beach this morning. Boston Harbor Now visited at the peak of the tide, around 1:50 this morning. Rescue boats in Dorchester Bay. Photo by Mike. 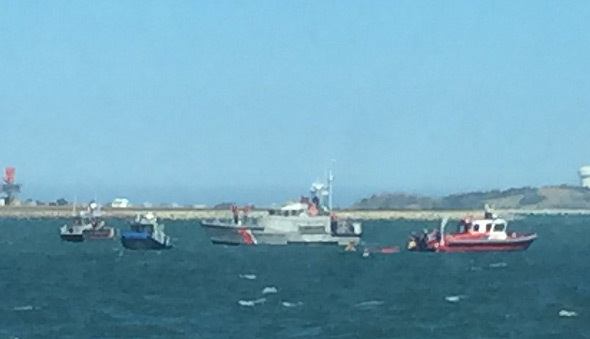 The Coast Guard teamed up with Boston fire and police marine units to rescue five kayakers who found themselves in some sort of trouble in Dorchester Bay off Castle Island shortly after 3 p.m. today; initial reports said one might have wound up in the water. John Duffill reports the marine units got all five out OK. 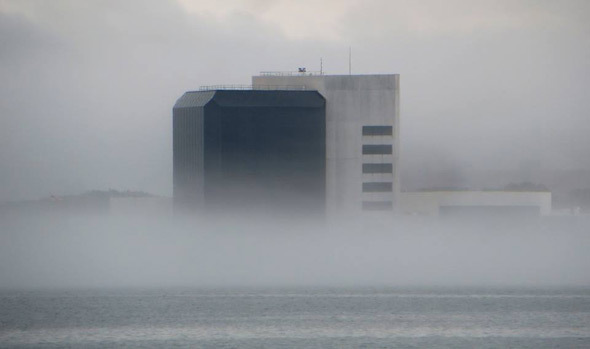 The Coast Guard reports plucking six people out of Dorchester Bay after their boat sank early this morning between Castle Island and Thompson Island. Read more. Troopers search water around 4 p.m. Photo by James. WBZ reports police this evening found the body of Kyzr Willis in the water off Carson Beach. The boy was last seen around 2:05 p.m. near the M Street bathhouse. Read more. 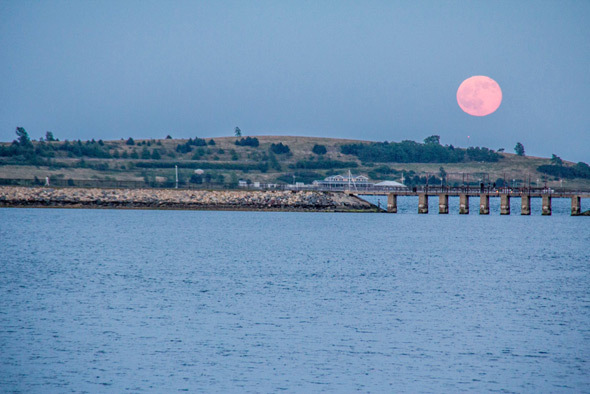 Nick Cosky watched the strawberry moon over Spectacle Island and Pleasure Bay this evening. 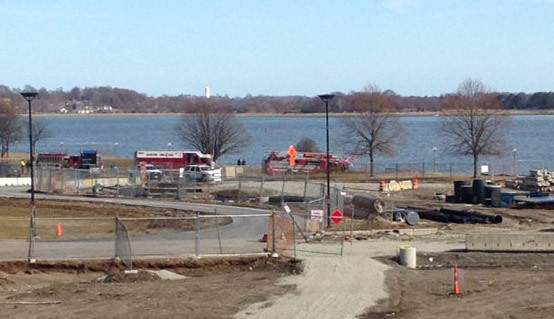 Boston Fire, Boston Police and Coast Guard crews all responded to the Dorchester Yacht Club off Savin Hill today on a report of a possible oil spill. But then they realized the stuff was actually pollen, probably washed down from I-93. A yacht-club worker said the pollen spills have happened before. Steve looked out over Pleasure Bay from Columbia Road and N Street at 5:37 a.m. yesterday. Copyright Steve. Posted in the Universal Hub pool on Flickr. UMass search scene. Photo by Mary Cappuccio. UPDATE: DA's office says the man was 25, from Lawrence, and that his death is not suspicious. State Police report investigators are trying to determine how a man's body in a car wound up partially submerged in the water off Columbia Point. Read more.